Just kidding, kind of. I'll highly recommend three for June that are all part of the TCM Summer of Darkness premiering Friday, June 5 and running consecutive Fridays through the entire months of June and July. The series will be hosted by well-known film noir aficionado Eddie Muller and contains numerous films that are exciting, engaging and most of all tremendously enjoyable. More information on the schedule, a free online film noir course and special U.S. theatrical screenings of Double Indemnity (previously reviewed here) can all be explored by clicking on the "TCM Summer of Darkness" image above. Keep in mind this special program lists all showings at Eastern Standard Time. My first recommendation is widely considered to be cinema's first identifiable film noir: Boris Ingster's (1940) Stranger on the Third Floor. 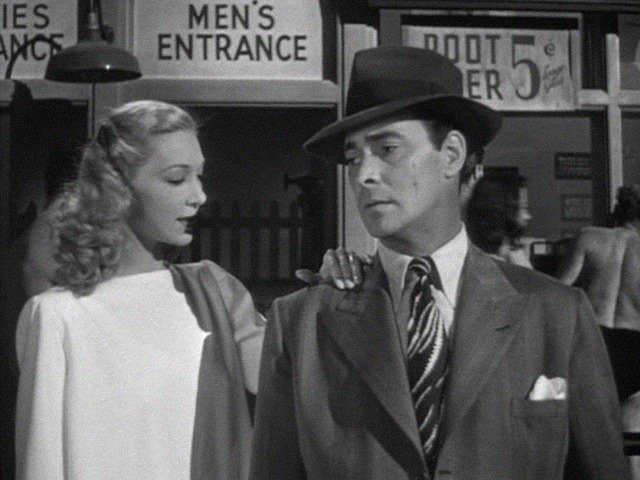 It has many of what would become noir hallmarks, i.e. a wrong man accused (actually two), expressionistic photography and lighting, plus a pervasive atmosphere of guilt, paranoia and doom. This film also fits my definition of noir as a story whose subject is crime but more importantly one that focuses on its participants' internal motives. In the crime films of the 30s like Public Enemy, Little Caesar and The Roaring Twenties the reason for their characters' criminal pursuits, or those who tried to investigate or stop them, was given little attention. Typically for the bad guys it was external influences, to get ahead in tough times and for the good guys simply to do their job. The best of these "gangster" films were flashy, fun, full of energy and bravado but didn't tell us much about the human psyche behind all of the nefarious activities their characters engaged in. Stranger on the Third Floor changed that. A reporter helps convict a man to death but later believes he may have made a mistake. Another murder takes place but this time, the reporter himself is accused and finds out first hand not only what it's like to be wrongly suspected, but to live in fear for his life while helpless to investigate further. Thankfully he has a devoted fiancee who can pursue his leads and hopefully uncover the real killer before it's too late. The mindset of this reporter is targeted all the way through, which helps make this film more and more captivating as the story progresses. It contains an outrageously vivid dream sequence full of abstract, disproportionate images, sharp angles and sinister shadows to further absorb us. When we do finally meet the killer (a perfectly cast Peter Lorre), he too has a terrifying but complex psychological back story which provides the added personal dimension noir films are noted for. These distinctive and brilliantly conceived RKO films noir were typically short in length but long on staying power. For the noir novice, I can think of no better introduction to this genre. The stranger will reveal himself on TCM (updated) Tuesday, September 18 at (early morning) 3:15am PST and for film noir fans, should not be missed. TCM's current monthly schedule can be confirmed by clicking on any of the above images. For those who live in parts of the U.S. other than the western region, the time zone can be adjusted in the upper right-hand corner of TCM's program. My next recommendation is 1947’s The Gangster. Like Stranger on the Third Floor, this noir was made on the cheap but contains complex characters that help it punch solidly above its pay grade. Barry Sullivan plays the title role of Shubunka as comfortably as fireside marshmallows, running the numbers racket in a waterfront area known as Neptune Beach with the police and local underlings both securely in his pocket. Shubunka has little charm or grace. He oozes cynical contempt for practically everyone who crosses his path. That’s one of this film’s, and noir’s, greatest strengths: the audacity to place a character’s weaknesses front and centre. Instead of trying to artificially enhance the self-serving Shubunka with likeable 30s gangster mannerisms of poise and class, the noir storytellers here defy us not to care what happens to a person consumed with unpleasant but identifiably realistic personality traits. Not only that, Shubunka’s one redeeming attribute, namely his genuine concern for a female friend, is the one characteristic that will most contribute to his tragic downfall. This fascinating little known noir is full of an idiosyncratic group of actors all of whom were, or would become, better known for their appearances in more recognisable films noir such as Joan Lorring (Three Strangers, The Verdict), John Ireland (Railroaded!, Raw Deal), Akim Tamiroff (Mr. Arkadin, Touch of Evil), Henry Morgan (Dark City, Scandal Sheet), Sheldon Leonard (Somewhere in the Night, Decoy), and Elisha Cook Jr. (The Maltese Falcon, Phantom Lady). Even Charles McGraw has a small role (T-Men, The Narrow Margin). Sullivan’s co-star was the U.K.’s answer to Sonja Henie, Belita. The year before The Gangster was released, she made another terrific noir with Sullivan for the “poverty row” King Brothers Productions entitled Suspense, the plot of which allowed Belita to show off her formidable ice skating skills. The Gangster was the last and most distinguished film directed by Gordon Wiles (Charlie Chan’s Secret, Prison Train) who would return to work as an art director on 1950’s The Underworld Story released the year of his death at the age of only 46. The Gangster will make his way (updated) down Eddie Muller’s Noir Alley Saturday, September 29 at 9pm PST and again on Sunday, September 30 at 7am PST. My final TCM recommendation will be familiar to readers who frequent this site: Once again it’s Hidden Gem #10 They Won’t Believe Me, previously reviewed here along with some words of admiration from The Summer of Darkness’ host Eddie Muller in the comments section below. Last time the channel organised a screening, it became an understandable casualty of a late substitution for one of Eli Wallach’s films after the actor passed away. I’m sure this time it will be a go and I strongly encourage readers to partake in one of noir’s most strikingly unusual and imaginative tales. It is believed to be appearing on TCM the morning of Friday, June 26 at 5am PST. My Soundtrack recommendation for the month of June is composer David Shire’s gorgeous score to Return to Oz. Sometimes a composer is so inspired to enhance the imagery on screen, he creates sonic pictures of his own that transcend the score’s purpose and that is precisely what has happened here. We soundtrack lovers certainly don’t have the right to expect a stand-alone work of such creative originality but when it does occur we are certain to indulge ourselves. Please join us. This very special 2 CD soundtrack has been recently issued by Intrada Records. It can be read about in detail and ordered by clicking on the accompanying image. A Happy Birthday shout-out to the supremely talented actress Gena Rowlands who turns 85 on June 19. What an array of amazing performances she’s given us: some in lesser known films such as A Child is Waiting and The Spiral Road, to those more recognisable but still worthy of additional attention in Lonely are the Brave and Faces. Her work culminated with the monumental tour de force portrayals in A Woman Under the Influence and Gloria. She’s a legendary performer who’s thankfully still going strong. My video recommendation this month is in keeping with the theme of noir: Michael Mann’s superb epic neo-noir Heat. Its primary greatness derives from the depth of its characters, perhaps on a more grandiose scale than say The Asphalt Jungle but highly effective nonetheless. This is achieved through an unflinching focus on their reactions and behaviour in a multitude of ever-changing situations. For instance, parolee Haysbert having to work in an awful fast food joint, Portman's deep desire for some kind of relationship with her biological father, and Noonan's calm and careful description of the bank layout. There's Kilmer's turbulent relationship with his wife Judd, who for Kilmer, will finally take a tremendous chance on by giving him a simple but profound hand gesture. Still another remarkable scene occurs between acting titans Al Pacino and Robert De Niro, the former a cop, the latter his prey, who take a time out to have an electrifying meeting of the minds at an L.A. diner. There are plenty of other "wow" moments. Personal insights into relationships abound throughout this towering crime saga. The countless number of people who helped make this film a supreme artistic achievement should all be extremely proud of the result. Not so well known was an unofficial contribution made by the late author, actor and former convict Edward Bunker. Bunker wrote the novel No Beast So Fierce while in prison which Heat's director Mann took a strong liking to. The novel was later optioned by star Dustin Hoffman and made into the film Straight Time (Hidden Gem #51). Bunker was Mr. Blue in Reservoir Dogs. He also wrote Animal Factory and the screenplay for Runaway Train which closes with the “No Beast…” Shakespeare Richard III quote he was so fond of. He worked as a technical adviser on both Straight Time and Heat, with the latter’s Robert De Niro, Val Kilmer, Tom Sizemore, Kevin Gage and Dennis Haysbert, teaching them how to think, act and react like ex-cons. (Of course he didn't have to teach actor Danny Trejo anything since they had previously met in prison). Author James Ellroy praised No Beast So Fierce as "the most gritty and realistic novel about armed robbery", which makes sense because that was Bunker's former profession! He was also the inspiration for Jon Voight’s behind the scene fix it man ‘Nate’, in Heat. Both Heat and Thief, Mann’s previous crime thriller, contain “high-end” burglar counterparts to the low-end “smash and grab” criminals in Straight Time, but all 3 films benefit greatly from strong real life characterisations. Heat's shoot-out staged in downtown Los Angeles is so frightfully realistic it is said to have influenced a couple of real life bank robbers who staged a similar heavily armed gun fight in an L.A. suburb a couple of years later. This pulse pounding, gritty and uncompromising thriller is a natural evolution of the caper genre and has not been bettered since. Ben Affleck's The Town came close but was spoiled by a self-conscious feel-good conclusion. Heat is available on Blu-ray in a Director's Definitive Edition from 20th Century Fox and can be ordered from Amazon.com, who ship internationally from the U.S., by clicking on the Blu-ray image.